This is a form of low back pain that runs down your leg, causing pain, numbness, or tingling in the leg that can range from a mild annoyance to being a deblitating condition. It is defined as pain caused by pressure or irritation of the sciatic nerve. 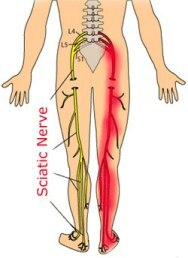 It can cause pain anywhere along the distribution of the sciatic nerve from the lower back to the sole of the foot. It can also cause changes in sensation and muscle power of the leg. • The main symptom is pain that shoots down from the lower back and buttocks to your leg. • You may also have numbness or tingling in your leg. • Sometimes your leg muscles are weak. • injury to your back (slipping and falling, or having something hit your back). Low back pain and sciatica can also be caused by infections, tumors, a ruptured disk in your back, osteoporosis, spondylosis (hardening and stiffening of the spine), or spinal stenosis (narrowing of the spinal canal from bone or soft tissue). • Learn to lift properly. Bend your knees and hips and keep your back straight when you lift a heavy object. Your health care provider will ask about your symptoms and examine your back. If your provider thinks you might have an infection or a bone disease, you may have some lab tests or x-rays, a CT scan, or an MRI. Often, nonprescription medicines for pain and inflammation, such as aspirin, ibuprofen, or naproxen, can ease the pain. Talk to your health care provider about whether you should take these medicines. Your provider may prescribe stronger pain medicine or other types of medicines. Your provider may prescribe oral steroids or you may be given a steroid shot into your spine to control pain and inflammation. Ice packs or a heating pad may help reduce pain. (Do not sleep on a heating pad because it could cause burns.) Your provider may also suggest physical therapy. A program of gentle exercise may speed your recovery. If you continue to have symptoms, you may need to have surgery. However, most people who have herniated disks do not need surgery. People who have sciatica with back pain recover more slowly than people with other kinds of back pain. However, you will probably begin feeling better within a few days of a back strain or injury if you don't strain your back again and if you take some medicine for pain and inflammation. Often the pain is gone in a week or two. • You have numbness or tingling in the inner part of your thighs (in a saddle distribution). • You have any new or increasing weakness in your legs. • The pain is not getting better. • You have new symptoms. • Avoid lifting more than 5 pounds. • Avoid frequent bending or other activities that make the pain worse. Many people find that taking both a calcium supplement at the same time as Tang Kuei gives a measure of relief of symptoms of back and nerve pain when the pain is at a low enough level that it does not need medication. Further reading through our articles on Sciatica health issues will give you a body of information that will help you decide what options you have to deal with the underlying causes of your problem through giving your body the nutrition products that will assist you body to heal from the inside out. We wish you well in your search for solutions to this Sciatica problem and your movement towards better health in all areas. SITE DISCLAIMER: Do these products “cure” anything? Of course not… but it stands to reason that if you cleanse your body and feed it the finest nutrition available, giving it everything it needs in balance, on a daily basis, that your body will do what nature intended, and give you the best possible chance to fend off sickness and disease. This Sciatica your health online information is not presented by a medical practitioner and is for educational and informational purposes only. The content is not intended to be a substitute for professional medical advice, diagnosis, or treatment. Always seek the advice of your physician or other qualified health provider with any Sciatica questions you may have regarding a medical condition. Never disregard professional medical advice or delay in seeking it because of something you have read. Any natural and/or dietary supplements that are not FDA approved or evaluated must be accompanied by a two-part disclaimer on the product label: that the statement has not been evaluated by FDA and that the product is not intended to "diagnose, treat, cure or prevent any disease”. The Sciatica resources on this your health online site are not intended to be a substitute for professional advice. While all attempts have been made to verify information provided in this publication, neither the author nor the publisher assumes any responsibility for errors, omissions or contrary interpretation of the web site Sciatica subject matter herein. The what is Sciatica your health online site Sciatica contents are solely the opinion of the authors and should not be considered as a form of advice, direction and/or recommendation of any kind. If expert advice or counseling is needed, services of a competent professional should be sought. The what is Sciatica author and the Publisher assume no responsibility or liability and specifically disclaim any warranty, express or implied for any products or services mentioned, or any techniques or Sciatica practices described.